What I wish I was eating. | I made that! What I wish I was eating. My disclaimer: I did not make these today. Nor did I make them this week. I made these sometime last year, I suspect right around this time…. I like to think of myself as a meatball enthusiast, in concept. If there was one dish that I think about more than any other, one that makes me get all warm and fuzzy at the mere mention, and yes, possibly one that I would choose as my last meal, it would be spaghetti and meatballs. I know what you’re thinking: “Wow, she must eat a lot of meatballs.” But the truth is that I almost never eat them. Hence this post. It’s the dish I always crave, yet never take the time to make. So here’s to cravings, may someone (John — are you reading this? hint, hint…) come along and fulfill them all. Well, except for the bad ones. You know what I mean. These meatballs were a discovery by Molly Wizenberg, of Orangette fame. She spent the day with the owner of Cafe Lago, a fantastic homespun Italian restaurant in Seattle, and learned all the tricks that make meatballs special. Knowing me this past year, I probably skipped all the important stuff, so you can read about it here. In the meantime, I mixed a bunch of yummy stuff in a big bowl. And swirled it all around. Then I shaped it all into adorable little balls. And into red sauce it went! Seriously though, this may be a short and sweet post, but these meatballs are fantastic. And if you happen to be a leftovers junky like myself, you will be very pleased. – Combine tomatoes with juice, butter, onions, and salt in large wide pot. Bring to simmer over medium heat. Reduce heat; simmer uncovered 45 minutes, stirring occasionally. – Discard the onions. Using immersion blender, process sauce briefly to break up any large pieces of tomato (texture should be even but not completely smooth). Season sauce with more salt and freshly ground black pepper. Remove from heat. – Combine the breadcrumbs and milk in small bowl; stir until breadcrumbs are evenly moistened. Let stand 10 minutes. – Place beef and pork in large bowl and break up into small chunks. Add 1 cup ground Parmesan, parsley, salt, and pepper. – Whisk eggs to blend in small bowl; whisk in garlic. Add to meat mixture. – Using hands, squeeze milk from breadcrumbs, reserving milk. 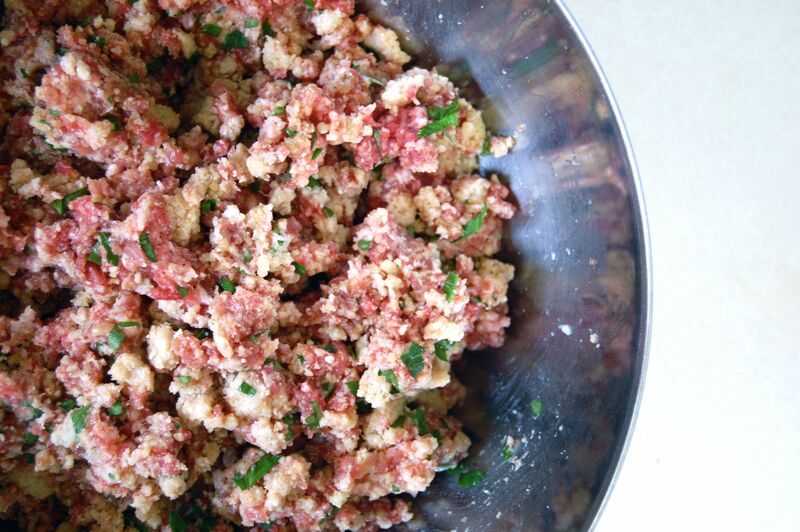 Add breadcrumbs to meat mixture. 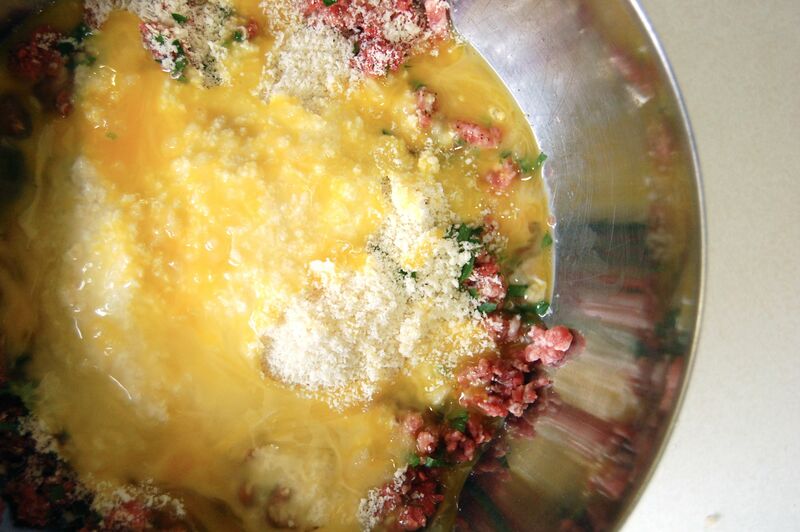 Using hands, quickly and gently mix meat mixture just until all ingredients are evenly combined (do not overmix). Chill mixture at least 15 minutes and up to 1 hour. – Moisten hands with some of reserved milk from breadcrumbs, then roll meat mixture between palms into golf-ball-size balls, occasionally moistening hands with milk as needed and arranging meatballs in single layer in sauce in pot. Bring to simmer. – Reduce heat to medium-low, cover, and simmer until meatballs are cooked through, 15 to 20 minutes. Good recipe. Great pictures. I am always glad to see your posts. I made that strawberry cake. Very yummy. This looks so so good. I can’t wait to try it. My son eats meatballs like crazy. The sauce looks exactly like one of my favorite Marcella Hazan recipes – I only add that San Marzano tomatoes are a MUST: they are expensive but oh so sweet & delicious. Picked by hand only when ripe & this time of year better than “fresh”. This is one of those recipes that are famous EVERYWHERE. In Peru we eat them all the time too! They’re actually quite easy to make, from what I see here, but still a good idea not to eat them every single day! I would add some veggies to the sauces to power it up. zuchini? Mushrooms perhaps? I love a classic like spaghetti and meatballs! I am usually one with a heavy hand when it comes to adding ‘fixins’, but there’s something so perfect about the simplicity of this dish. I am always excited when I see a new post from you, it’s the anticipation and the knowledge that you deliver. Every time. Thanks so much, Brandi! These look really good. We eat a lot of meat balls especially in the winter. I’m looking forward to our first batch! True, between Italians and meatballs there is no greater love. Though I must confess to being just a bit worried. 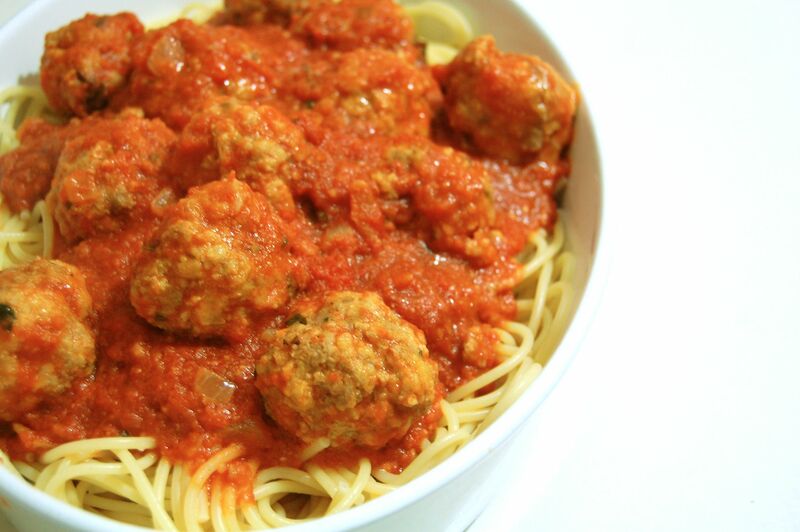 Could it be you really added the meatballs directly to the sauce? No, that can’t be true. Such a move would be pazzo. First you browned them right? Tell me that’s what you did. And then, nicely browned, those lovely meatballs were slid into a pot of sauce at the gentlest simmer. Right? Making these today and wondering if you browned the meatballs before putting them in the sauce, or not? Thanks, Brandi, for all the wonderful recipes. I am so looking forward to meeting you at the wedding! Hi Vicki! Nope, I slip them right into the sauce without browning them. It sounds a little odd, but it gives the silkiest meatballs imaginable. Enjoy and I’ll see you in August! 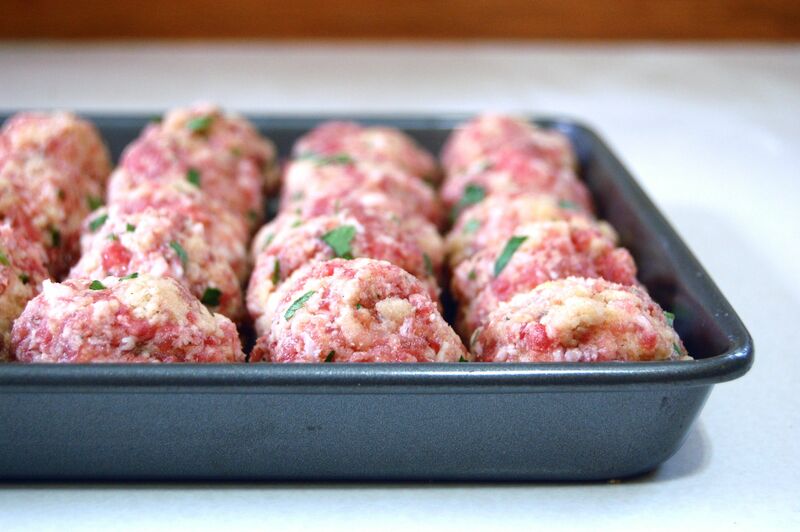 I have been seeing so many luscious looking meatballs as of late….yours included….must try some! No browning? Wow!! I wasn’t invited to the wedding! I made this last weekend. I loved it but my guys kept asking about a meat sauce. The tomato sauce (used Muir Glen whole ‘maters) was addictive. These are amazing! Thank you!! Making them for the second time tonight. I didn’t read through the recipe and the part about taking out the onion, so I had chopped it already and just processed it with the rest of the sauce and it was great. The sauce is amazing as well as the meatballs! So, I hope you’re not angry but I’m not going to comment once on your balls of meat above but rather your layers of pink below- I cannot WAIT to try that strawberry cake over the summer!!! WOW! I made this tonight and was thrilled with the result. And tomorrow’s lunch will be awesome, too. Many thanks to you (& Molly)! I also made chocolate souffles this week, with my 5 yo son “helping”-mostly by licking spoons, and they turned out really well. He asked for one for breakfast this morning and genuinely thought he might get one because of all the eggs in them. Anyways, thanks for doing such an awesome job teaching that class! Do you think they would taste the same if I bake the meatballs so that I could freeze the extra for another time?